Le jardin Secret is a lovely spacious bourgeois home in the centre of Mansle with its own private enclosed garden and parking for 2 cars. Conveniently located on the main road into Mansle therefore easy accessible from the N10. Ideal as a base for exploring the Charente area. So whether you are looking for a holiday home, a weekend away not far from Angouleme or a long term stay while home hunting in Poitou Charentes, this is a great place to be based at. Walking distance to shops and restaurants, we can highly recommend italian restaurant and pizzeria La belle etoile, and the river. Mansle is a small and pretty town on the river Charente and offers most facilities like a bakery, butchers, weekly market with fresh produce, various restaurants, a hotel, tourist office, hairdressers, supermarket and many more. You can also arrange a canoe/kayak trip by the river, there is a hypodrome and lido too. Le jardin secret feels like a real home, its spacious, has heigh celings, bright rooms and a beautiful old staircase. At the back of the house is a fully enclosed courtyard garden which is ideal for keeping cool during the summer as it s partly shaded. We look forward to welcoming you at Le jardin secret , bienvenue! I live not far from the property, approx 10 mins. Love being retired here for 6 years, enjoying the long hot summers, a bit different from my life in the Midlands ! I really liked the proportions of the house, the high ceilings, old-fashioned staircase, the bright rooms, which all create a spacious feeling. Always wanted a walled garden - et voila ! Great location, in town with parking, restaurants and shops nearby, easy reachable from N10. 20 minutes drive from large town of Angouleme. There is a separate toilet next to the bathroom on the first floor - 3 toilettes in total. All cotton, percale and some washable linen, mostly white. Spacious diner / kitchen of 15 square metres. Parquet flooring. English and French books, paperback & hardback fiction mainly. Enclosed private courtyard garden at the back of the property Total size incl. parking area: 252 square metres. at the Charente river, less than 10 minutes walk from the house. Open air Public pool only around the corner with separate childrens pool. 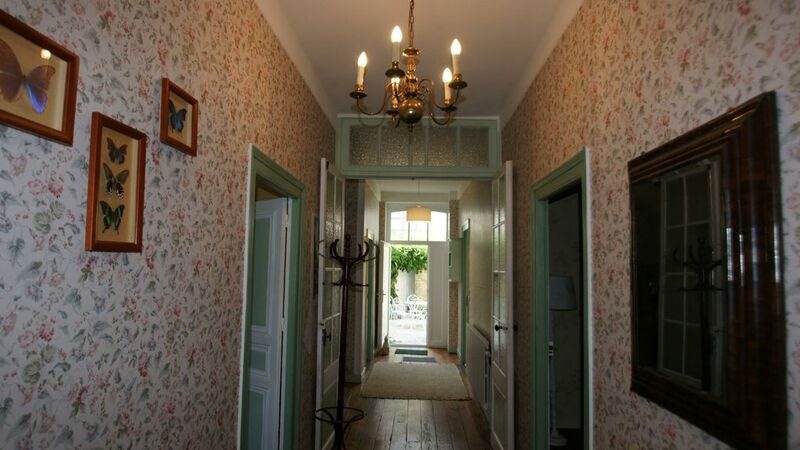 On the ground floor there is a very large hallway leading to all rooms and the 1st floor. All flooring exist of original wooden floors except the kitchen. There is also a utility room (buanderie) which houses garden cushions and parasol and the washing machine. It has also storage space for suitcases etc. There is a highchair and travel cot in the property.